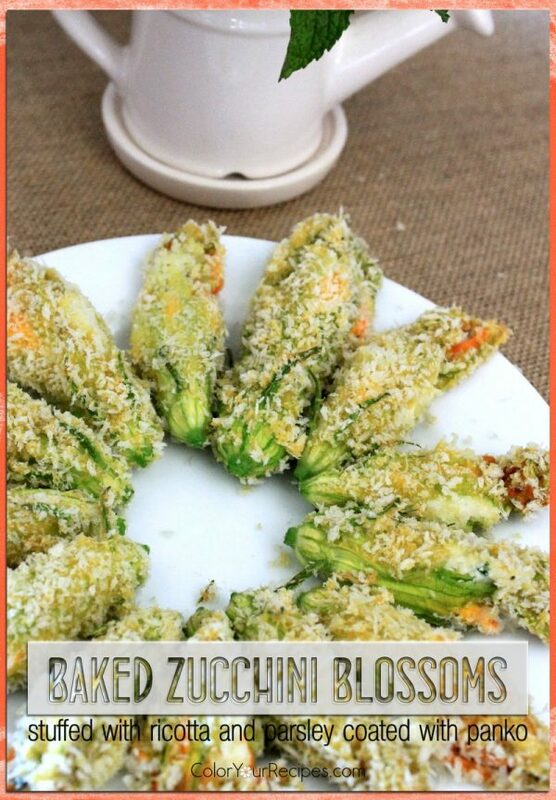 This is a fun, delicate and exotic appetizer made with zucchini blossoms filled with creamy ricotta and baked to perfection. 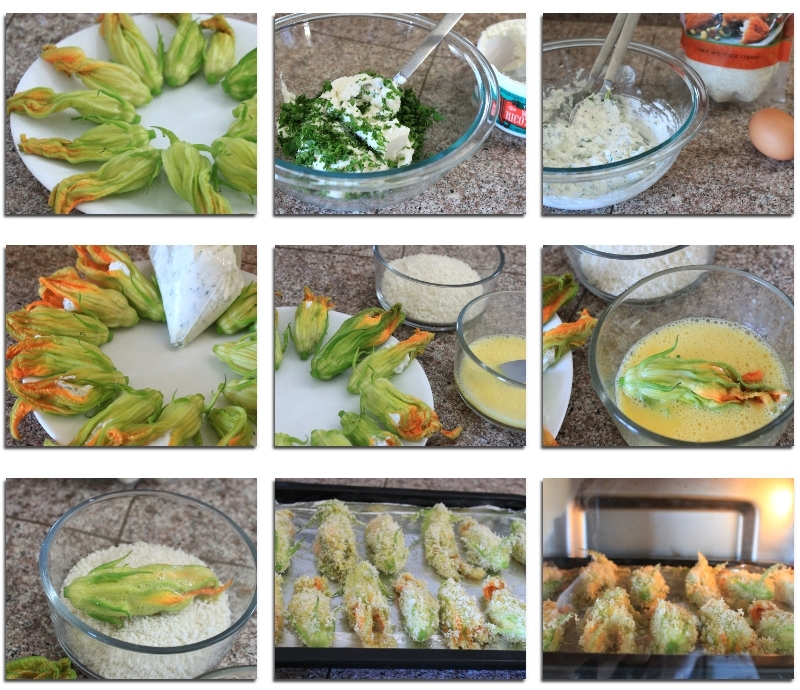 I got these zucchini blossoms when visiting the local farmer’s market…they were so beautiful therefore could not resist them…isn’t this an awesome way to celebrate the first day of summer? One thing I knew…I did not want to fry them, and searched for a baked recipe…came across this recipe which I pretty much followed it with some changes. 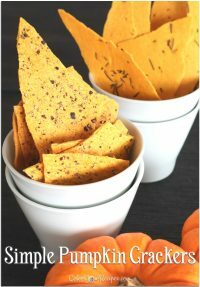 These are so easy and very attractive little bites. By stuffing the flowers with ricotta, every bite is a combination of creamy ricotta with the crunchy panko…heavenly delicious! 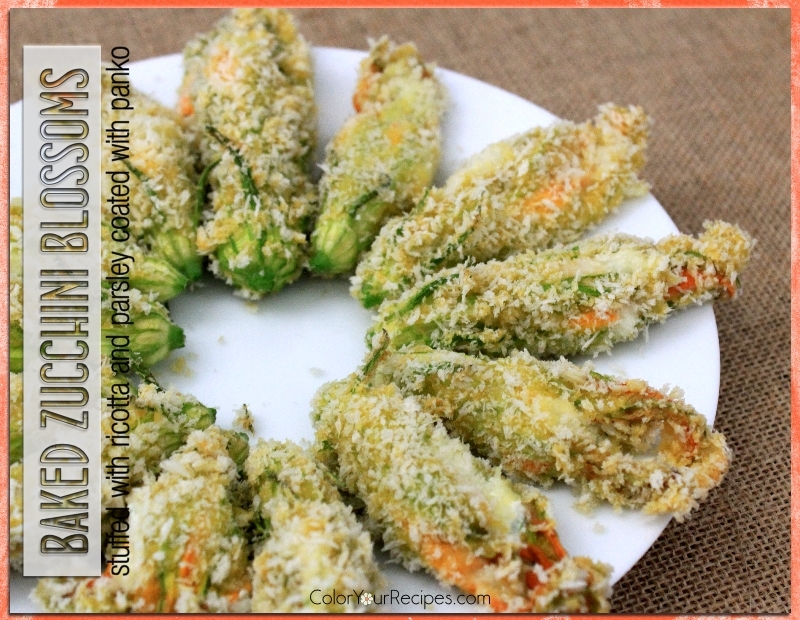 So if you come across zucchini blossoms, do not hesitate in getting them and try this simple recipe. Preheat oven to 350F and prepare a baking try with parchment paper or aluminum paper. Mix in a medium bowl ricotta, parsley, salt and pepper. 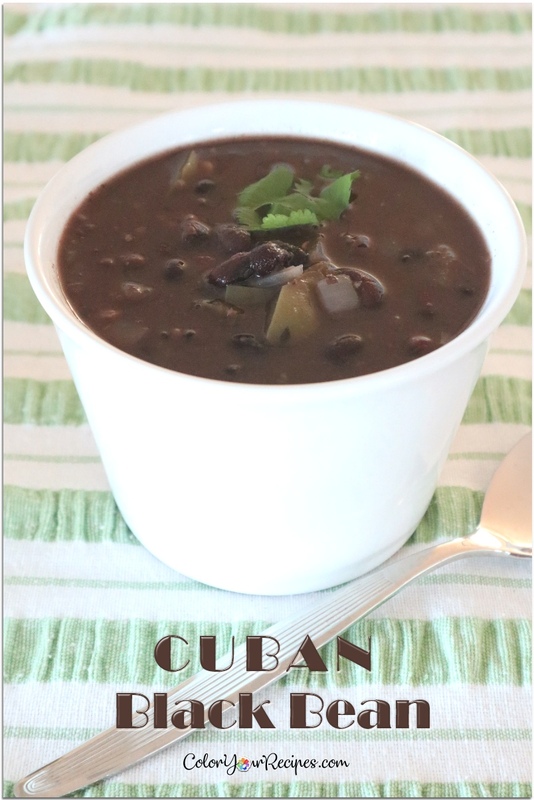 Taste after mixing adjusting for more salt or pepper as desire. Spoon the ricotta mixture to a small plastic sandwich, seal and make a small cut off by the corner. In another bowl or deep plate beat the egg slightly and on the second bowl or deep dish place the panko. Stuff the zucchini blossoms from the opening of the flower and after filling with the ricotta mix, twist gently the flower at the tip to hold the stuffing in. Dip the filled zucchini flowers first in the egg and then into the panko, making sure that the whole flower is covered. Place the coated flowers on the tray. 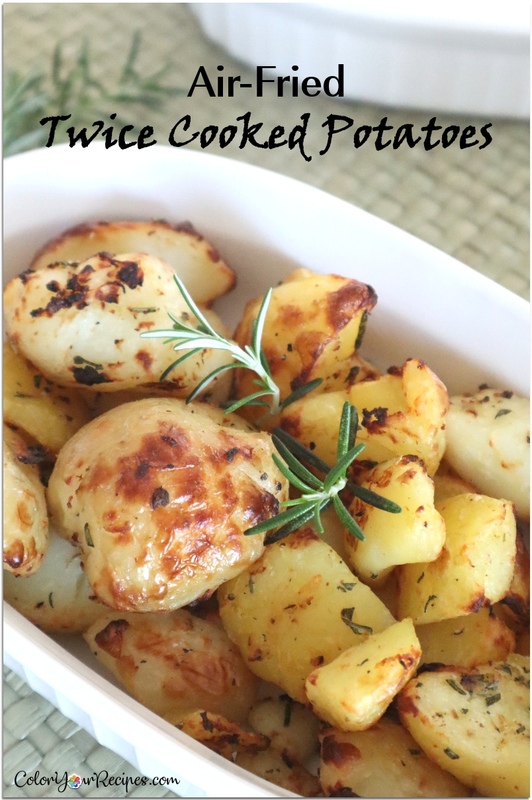 Repeat the same procedure with the remaining zucchini blossoms and bake for 15 to 20 minutes. 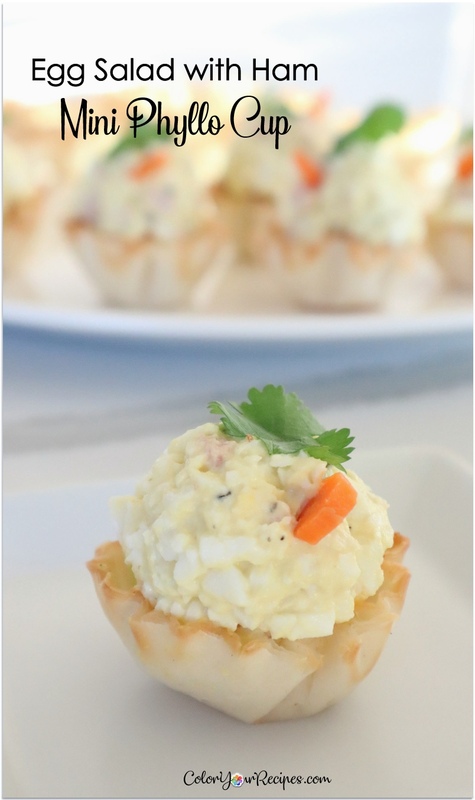 I you enjoy this simple appetizer recipes. 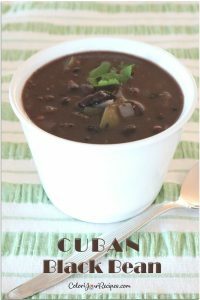 you might want to check on the Appetizer’s recipe here at Color Your Recipes. 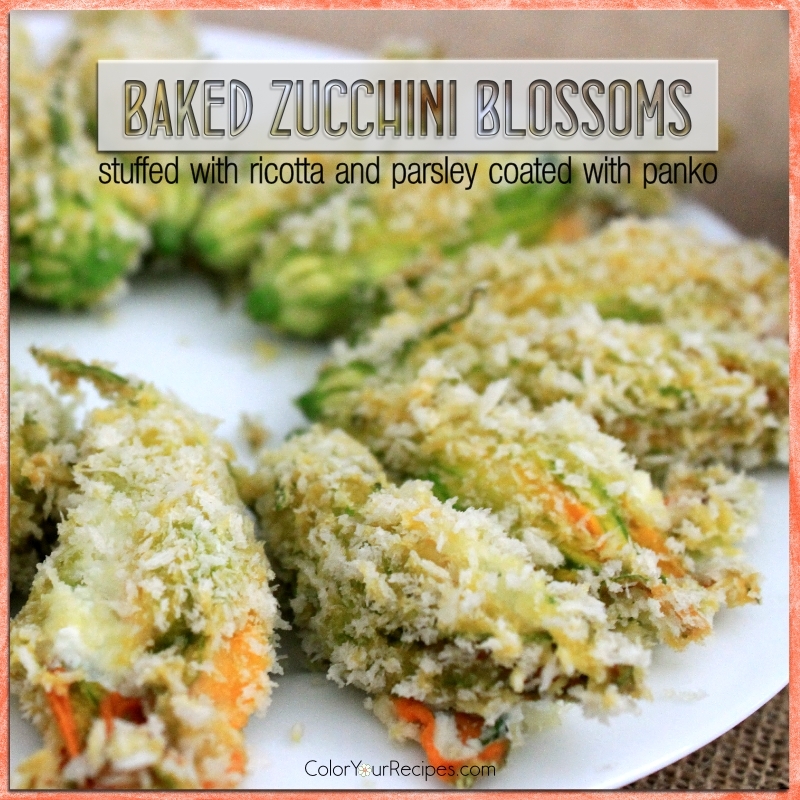 Did you know that zucchini blossoms are edible flowers? All the squash flowers are edible.